Rare Cherished Teddies Crystal. This is the RARE bear with the R stamp on the base. Hang On Were In For A Wonderful Ride. 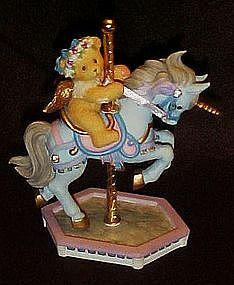 Girl angel teddy bear Riding a Unicorn carousel horse. Figurine #589942. Gold hoofs and wings. Rhinestone accents. Perfect condition but no box. Retired.